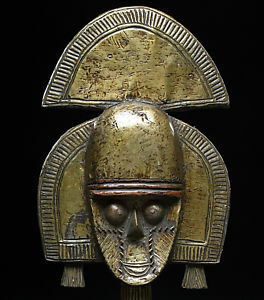 Types of Art: The Pende carve numerous types of masks, most of which are associated with education and initiation rituals. In the northwest part of the territory wooden figures are sculpted. Carved stools, staffs, chairs, and swords are used by chiefs and other important people to signify their power. Religion: The ancestors (mvumbi) are placated through various rituals and offerings. The family head is responsible for taking care of the shrines and appeasing the spirits. The Pende recognize that spirits may be either good or bad, depending on the manner in which they died. Also, when ancestors are neglected they will cause bad things to happen to the family. The result may be sickness or hardship, both of which require a visit to the local diviner to determine the best way to appease the spirits. Through the diviner, the spirit will sometimes demand that a wooden sculpture be commissioned so that offerings can be made to it.